One Step Complexion Protection and Perfection for Natural, Radiantly Smooth Skin. Seamlessly apply this luscious multi-tasking cream for instantly flawless complexion that is boosted with hydration. Available in four shades: light, medium, medium dark, and dark. When I saw this product in store, per usual, I was excited to give it a try. I've always been a fan of the affordable Nicka K lipsticks so I was intrigued to see what their BB Cream would be like. This BB Cream took some work to figure out. 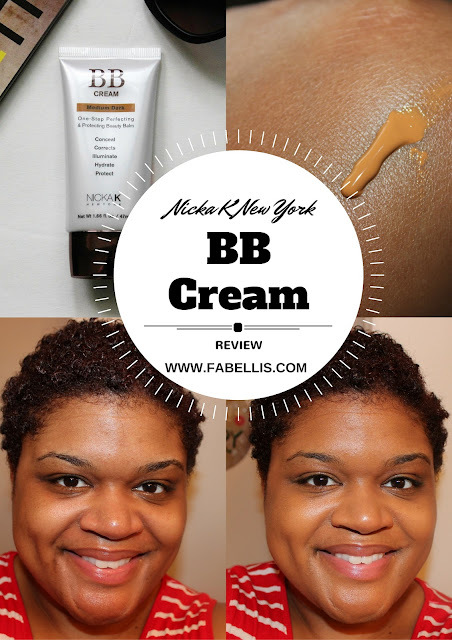 The first time I tried the BB Cream, it was without primer. I washed, toned and moisturized my face as usual and then applied the BB Cream. The application is very nice. It went on smooth; however, I find it to be a bit sheer. I did have to touch up a few spots with concealer. Overall, it went on nicely and gives a nice glow. However, within a couple of hours, my face looked like an oil slick. So, I decided to try it again with primer. I have combination skin, but I still sometimes like to use nourishing skin primers. I started with the nourishing primer first and had yet another oil slick. I thought I would be smart the next time and use a mattifying primer and this is when things got a bit strange. The BB Cream would not absorb into my skin. It was like I was just swirling it around on my face. I could not get it to absorb or smooth out so it was a no go. I was ready to give up on this BB Cream. I decided to give it one more chance. This time, I used one of my favorite face sprays, Smashbox Photo Finish Primer Water. After moisturizing my face, I sprayed the primer water on my skin, waited a few minutes and then applied the BB Cream. Eureka! This time was the charm. I set my makeup with translucent powder and Smashbox Photo Finish Primer Water. This made the BB Cream last over eight hours on my skin with only one or two blots for my oily nose. To sum it up, I really think this BB Cream is more ideal for people with dry or normal skin. It can be a challenge for those with combination to oily skin because it definitely is more of a hydrating BB Cream. How Does it Compare to the KISS Aqua BB Cream? For years, I have raved about the KISS Aqua BB Cream. It's one of my favorites because of the amazing coverage. One of the reasons I was even in the market for a new BB Cream was because I was looking for something more lightweight. The KISS Aqua BB Cream has more of heavier feel to it whereas the Nicka K New York BB Cream is more lightweight. Of course, with the lightweight feel, you have less coverage. I find that with the Nicka K New York BB Cream I still have to apply concealer to certain areas. Although they are the same type of product, I think to me they don't compare. The Nicka K is easier for me to use in spring and summer. I would rather use the KISS Aqua BB Cream in fall and winter. Maybe. I don't think the Nicka K New York BB Cream is ideal for combination to oily skin; however, if you are willing to put in the work to find the combination that works for you, you will definitely have a nice alternative to foundation. To learn more about the Nicka K New York BB Cream, click here. Would you give the Nicka K New York BB Cream a try?